Don't miss staying at this warm and inviting luxury cedar cabin in the forest that was remodeled in 2019 - it is also two separate but attached homes in one (you get both for the one quoted price--one home is upstairs and one is downstairs and they are connected by interior stairs). Most cabins in Pollock Pines are on a steep hillside and close to the road - but not this cabin. It is set back on 5 tree-filled acres that are usable, walkable, and has play sets for kids and a year round fresh water stream right on the property - providing a romantic place to sit by the stream, a place for kids to explore, and beautiful sounds of water (most other cabins can only hear the water but this property has the stream running on the property). Each floor of this cabin is set up as its own separate home but they are connected by interior stairs. This cabin has two master suites (each with its own bathroom), 3 full bathrooms - one with a Jacuzzi tub, two separate and full kitchens, two family rooms, two washers and dryers, a large dining room and a gameroom. There is a lot of privacy for a large group or just spread out and enjoy the space if you are a small group. The sleeping arrangements: Each master suite (2 of them) has a bathroom and king bed, the other two bedrooms each have a queen bed and a twin that rolls out from under the queen beds (and a shared hall bath). Each family room (2) has a full size sofa bed. This totals 2 kings, 2 queens, 2 twins, and 2 sofa beds. While you could sleep 14 people sharing beds, the county ordinance allows a total of 10 people plus children 5 and younger for a cabin of this size. In other words, a total of 10 people ages 6 and over (children 5 and younger are not counted in the total sleeping count). More people can visit during the day as long as they do not sleep over. You will not be stuck in the cabin all day like in other cabins that have a steep property. Since the cabin is set back from the street, the forested property provides privacy and a feeling like you are camping in the forest but with all of the luxuries of home. Take a walk through the forest on this property and have a picnic at the picnic table by the private stream. Even though you are tucked away in the trees, this cabin is in an established neighborhood and is close to all amenities - including the Lake and two private neighborhood swimming pools, tennis courts and a playground (including a swing set, horseshoes, pool table, and ping pong). The cabin also has its own horse shoes, pool table, ping pong table, games, and swing set - all within full sized warm cedar walls. You don't have to bend down to stand up or walk like in A-framed cabins. If you really want to feel refreshed from a vacation then you have found the right place. You won't have neighbors watching your every move. You will have room to run and play and simply refresh your senses. This Luxury Cabin was updated in 2019 and has stainless steel appliances, granite tile counters, custom tile in both master bathrooms, new windows, individual thermostats in each bedroom and common area room for personal heating and air control, Hi-Speed satellite internet, Premium TV channels - all within warm cedar lined walls. Only the best. There is something magical about this cabin that keeps people coming back. Sit inside by the fire at night, lay on the large balcony under the trees during the day and sit by the private year round stream or go out on a different adventure everyday. 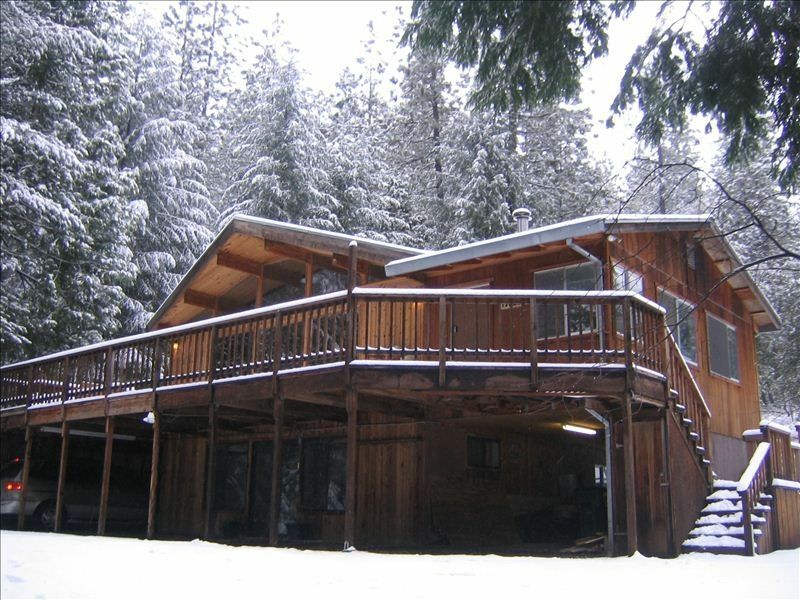 This luxury cabin is located near Jenkinson Lake in Pollock Pines. At the lake you can go boating (bring your own or there are canoes, pedal boats, row boats, and kayaks for rent). Visit the museum, go hiking along one of the many trails, go horseback riding (many equestrian trails), bicycle along one of the many trails, go on a picnic, or go fishing. You may catch trout, small mouth bass, or blue gill. The nearby rivers also offer great opportunities for White Water rafting. And don't forget the neighborhood also offers 2 pools, tennis courts and playgrounds (pool open in the summer from Memorial day to Labor day). Other activities include panning for gold in the original location where gold was discovered resulting in the 1849 gold rush. Or head to Apple Hill where you can visit one of the many ranches along the Farm Trails offering sweet corn, vine ripe tomatoes, fresh green beans, chestnuts, pumpkins, and colorful bouquets and much more (type of harvest available depends on the season during your stay). Many farms have Bake shops, pony rides, and various other activities. Don’t miss stopping at the Fudge Factory! Apple Hill also provides tasting rooms with award winning wines. Apple Hill is one of the two appellations within El Dorado County. The other is located south of Pollock pines in scenic Fair Play – all within 3 miles of each other. A map with the Farm trails and wineries will be provided. If you are looking for a great game of golf you can play at a truly championship golf course offering breathtaking views of nature. Or take a visit to Historic Placerville for Antique shopping or boutique hopping. Many restaurants and shops can be enjoyed. You may want to take a day trip up to South Lake Tahoe. This drive is only about 45 miles and will provide for lots of entertainment and gambling opportunities. In the winter months you will have plenty of opportunity for skiing at one of the local ski resorts. Sierra-at-Tahoe is only about 30 miles down Hwy 50 from this vacation home. Many others are located between Pollock Pines and South Lake Tahoe. You can also go sledding at Adventure Mountain. It is also about 30 minutes down HWY 50 and is only a parking fee and sled all you want for free! Click on the calendar for availability which is always up to date. Feel free to e-mail or call today. Last minute reservations are welcome. My husband and I purchased this cabin years ago and fell in love with it. It is so peaceful and romantic for us - while at the same time providing a great place for our kids to explore on the property's 5 acres in the forest. We have been renting out this cabin to guests for over a dozen years as a vacation rental so we are experienced and have worked out all of the kinks years ago. We have memories at this cabin to last a lifetime - and I'm sure you will too. Near Lake Jenkinson in the Sly Park Recreation Area. Gorgeous 5 acres in the forest with a year round fresh water stream on the property. Landline provided. Local calls within the USA are free. Long distance needs a calling card. Over a dozen cars can fit on the long driveway on 5 acres. (2) One in each of the 2 kitchens. (2) Two full kitchens. One on each floor. There are two dining rooms (one on each floor). One has a large table with 8 chairs and is near a kitchen table with 4 additional chairs. Another dining room has bench seating that seats 6. (2) TV has premium channels like HBO. Extra TV in second family room. Access to private neighborhood tennis courts. 2 neighborhood swimming pools in the summer months. There are also Tennis Courts for use year round (when they are not covered in snow) as well as a neighborhood lodge. 5 Tree-Filled Acres with a year-round stream. Swing set, playground, pool table, ping pong table, and horse shoe set on the property. Membership included to the private neighborhood lodge with foosball, ping pong and pool table as well as tennis courts, two swimming pools, and a play ground (swimming pool is open in summer and tennis is closed during snow). Satellite TV with premium channels like HBO, radio music stations, Wireless Satellite Broadband, Neighborhood Hiking Trail and close to Jenkinson Lake in Sly Park Recreation Area. Smoking outside only. White Water Rafting, Red Hawk Casino, Gold panning, Wine tasting, Harvest fruit on one of the many family run farms on the Farm trails - as featured in Sunset Magazine, Fudge Factory, Lake Jenkinson, and so more when you are up in the Sierras! Rates are subject to change until reservation is confirmed. Please consider purchasing vacation renter's insurance.